PERMANENT PAPER A3 DURACOPY Synthetic Paper (Opaque White Film) Box 100 sheets. Permanent Paper A3 Duracopy looks and feels like paper but that’s where the similarities end. 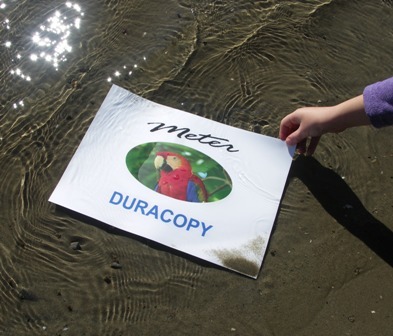 Duracopy A3 is a white coated polyester film that won’t bend, bubble or curl and will go through most laser printers and copiers. The Permanent Paper product is tear proof, water proof, grease and dirt proof and won’t yellow with age. Print in Black and White or full colour photographic images. Also known as Tear Proof Paper or Waterproof Paper, Permanent Paper is available in A4, A3 and A5 size. Industrial Training manuals in wet or dirty environments or archival.